Complaints over blue badge fraud and abuse in Northern Ireland have surged by more that a fifth in the past year. Drivers have made almost 5,300 complaints to the authorities since 2008 over people falsely using blue badges to avail of parking perks. More than 600 people were fined over the period after being caught misusing blue badges, which are only meant for vehicle users with severe mobility problems. Blue badge holders are able to use disabled bays, park free in paid-for spaces and for up to three hours on yellow lines. Abuse of the scheme includes blue badges being used by drivers who have no mobility issues and vehicles parked in disabled bays without a blue badge. The misuse can also extend to badges being copied, forged or stolen and tampering with expiry dates. Penalty notices of up to £90 can also be issued for vehicles caught abusing the blue badge scheme while a criminal conviction can attract a £1,000 fine. Last year 841 complaints over blue badge misuse were made – an increase of more than 21 per cent on the 694 reports in 2012. It represents an upsurge in the annual number of tip-offs after the figure dipped in the two years following a peak of 1,073 in 2010. The number of people issued penalty notices after being caught misusing blue badges has fluctuated over the years with a peak of 116 in 2011. More than 100,000 blue badges have been allocated across Northern Ireland. Under the rules badges can only be used for the holder’s benefit, meaning for instance it cannot provide parking concessions if the badge holder is a passenger not leaving the vehicle. The Department for Regional Development (DRD) said a specialist parking enforcement team for blue badge misuse is deployed to every main town on a rotational basis but primarily in Belfast. (PCN) if they spot blue badges or disabled bays being misused. 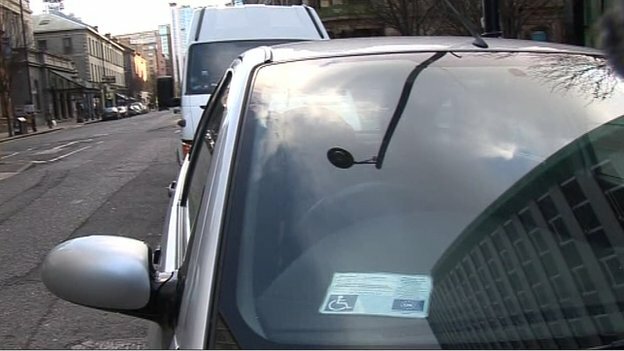 A spokesman said the parking attendants act as a deterrent and a “demonstration to legitimate blue badge holders that action is being taken to protect the proper use” of blue badges (BB). “They undertake a more detailed level of investigation, looking beyond the usual expiry date or incorrectly displayed BB by focusing on the immediate whereabouts of registered BB holders at the time of parking,” he said. “When a vehicle is detected parked for the purposes of claiming parking concessions under the BB scheme by displaying a valid BB, and it is proven that the BB holder is at another location, then a PCN will be issued according to the parking restriction being contravened.